Like something straight out of a Gradius-inspired dream, defense contractor Raytheon has unveiled a plan to unleash swarms of flying robot decoys onto the battlefield. Before I address the cloud of mechanical terror I just mentioned, we should cover the basics. Specifically, the military's love for the MALD. That stands for Miniature Air-Launched Decoy, and in layman's terms it refers to a device that is launched like a missile, activates in mid-air and proceeds to totally wreak havoc on the enemy's ability to continue fighting. From decoys that convince enemy weapons and radar that they are, in fact, multi-billion-dollar airplanes, to the more direct decoys that simply explode, the MALDs are quite literally miniature airborne robots bent on destruction. So, what's more impressive than a MALD? How about a "cloud-like swarm" of the things? Raytheon, a defense contractor known for blatantly lifting design ideas from Stan Lee's brain, has unveiled a plan that will allow the military to deploy hundreds of MALDs simultaneously. Dubbed "MALD Cargo Air-Launched System," the concept allows racks of the decoys to be dropped from a C-130 transport plane. Following the drop the MALDs would self-deploy, activating in freefall, and go about their business. Specifically, the idea is that this cloud of angry man-sized metal wasps (which Wired aptly describes as "a cross between a cruise missile and an aerial drone") could be used to protect military planes from enemy attack. 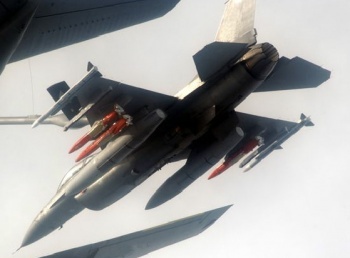 There are few things in existence that worry the pilot of an F-16, but the top of that list would be guided missiles. Given such a situation and the presence of a MALD swarm, the decoys could use their on-board countermeasures to convince the approaching missiles to explode prematurely. Even more impressively, a single MALD could convince the missile's guidance systems that it was a preferable target to the actual war plane, then lead the weapon far off course. Originally the MALDs were designed to be sent at targets in advance of bombing runs. The enemies would waste their missiles on the decoys, thus protecting the bombers. Recent advancements however have given the MALDs sensor suites, supersonic-capable engines and on-board munitions, making the swarm less an analogue to the chaff bombers used to drop to foil oncoming missiles, and more a cloud of miniature autonomous war planes. It's an impressive use of our increasingly robust technology, but it seems almost inevitable that these MALD swarms will develop into weapons in their own right. We've been using unmanned decoys to attack targets for years now, so the logical leap to "let's attack with a few hundred unmanned decoys" is almost assumed. Of course, that's the point in the evolution of human warfare where things start spiraling straight into "machine uprising" territory. How do you fight explosive, giant, metal locusts armed with machine guns, and infrared sensors? You don't. You dig yourself into a hole and hope Michael Biehn isn't too busy to save you.